Bandforte is a specialist application that helps you manage a school music or band program. Designed for a smartphone or tablet Bandforte provides instant access and updates: for those times you need to check something right away. It is designed to be finger friendly, quick and easy. Use Bandforte as your band’s mobile communications hub - you can call, text or email your band contacts with one touch. Anywhere, anytime. Access Bandforte just as easily on your PC or laptop. Like to see a Demo? Contact Us if you’d like to try Bandforte yourself. Bandforte uses industry standard HTTPS secure web communication and is hosted on highly secure web-servers running at Rackspace Sydney, with nightly back-up. A complete repository of Players: Quickly see contact details, band membership, attendance, tutor details and any instrument loans. For new customers, we can help you with an initial upload from your files. A Parent Hub where parents can register new students and see music program news and key dates. Manage your Groups: Monitor attendance with a simple tick list on your phone, produce band reports, edit key details and add or move players between ensembles. An Overview of Instruments owned by your school showing type of instrument, how many you have, those available, those on loan and those in for repair. 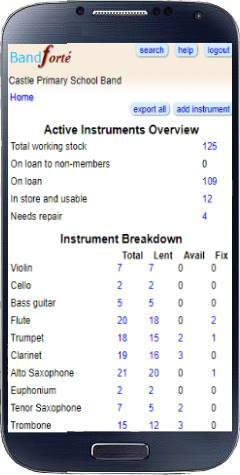 One touch to see a breakdown by category; then specific instrument details including repair history. 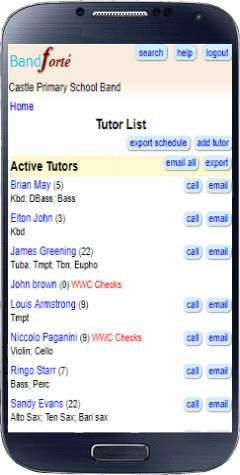 The Tutor Overview page allows you to quickly phone or email and see instruments taught. Tutor Details shows assigned students. All functions in Bandforte maintain a historical record and change log.